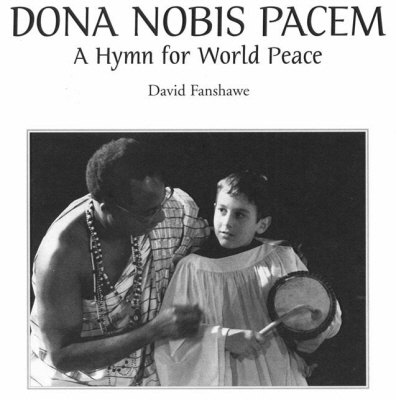 Dona nobis pacem (A Hymn for World Peace) was commissioned by Nicholas Oppenheimer. The original ensemble arrangement was first performed in October 1994, in Poole, Dorset, by soprano Wilhelmenia Fernandez; the Choristers of St. George’s Chapel, Windsor; and the Bournemouth Symphony Chorus, conducted by Neville Creed. This concert, filmed by BBC Television, celebrated the launch of the premiere recording of African Sanctus and Dona nobis pacem (Silva Classics). The symphony orchestra arrangement of Dona nobis pacem was commissioned by Whitgift School for their Millennium Concert at the Royal Albert Hall, London, April 2000, with the Royal Philharmonic Orchestra, conducted by Christopher Tinker. The short version of this new symphonic arrangement, was premiered at Southeast Missouri State University, Cape Girardeau, USA, in May 2004, conducted by John Egbert. The conductor Julian Williamson writes: "Musically, Fanshawe’s Dona nobis pacem derives from much of the material in African Sanctus. The opening statement is in fact an inversion of ‘Et in Spiritum Sanctum’ and a reworking of the final ‘Gloria’. Composed in F, the home key of the ‘Sanctus’, it is based on a canonic structure in which the themes are handed round from voice to voice and instrument to instrument. This allows a text which began in a deliberately simple way to build to one of considerable complexity and power and at the very point when the contrapuntal ideas reach their height, they are interrupted by the soprano soloist’s dramatic recitative (long version). This by its short, stark phrases, throws into relief the long rolling lines which have preceded it, after which the canonic idea is resumed and the sound is allowed to sink back gently into peace whence it emerged."